Both players were very close in chips when they got it all in. It was a coin flip with Anthony holding [As][Qs] against Soukha's [3h][3d]. 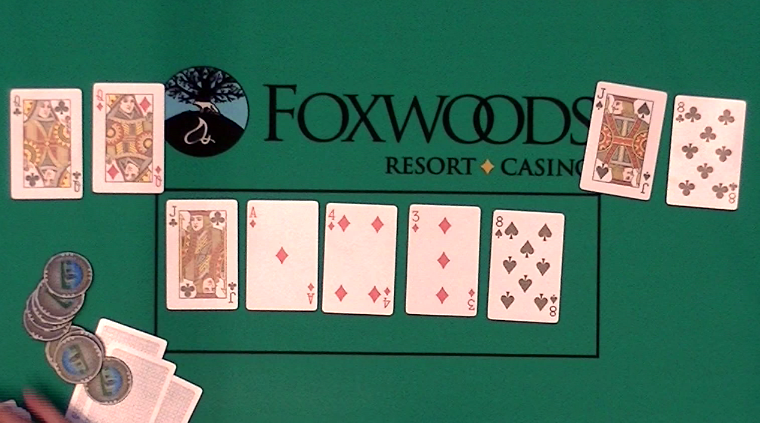 The [6c][Ah][9h] flop favored Anthony, and no three appeared on the [8s] turn or [6d] river. The stacks were counted down, and Anthony had Soukha covered. 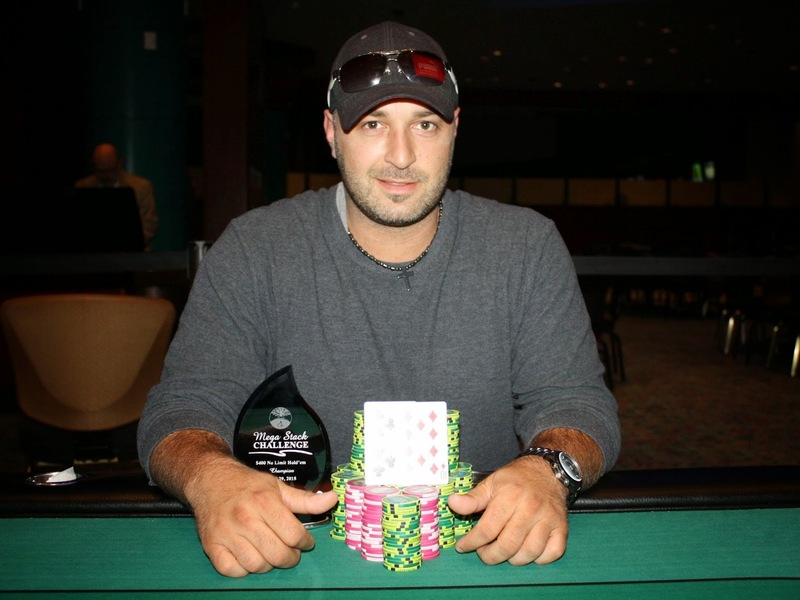 He will win Event #9 $300 NLH Big Stack, the trophy, and the $8,533 first place prize. Congratulations, Anthony! 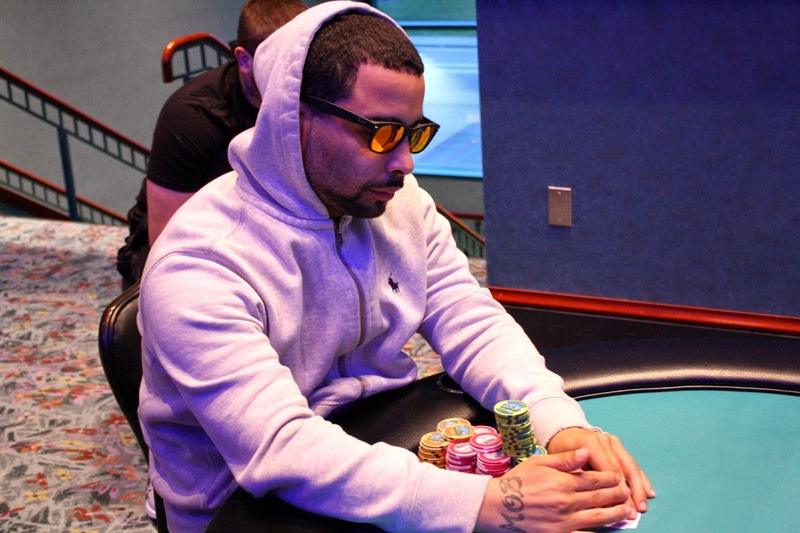 On a [Qs][8d][Qd][4h] board, Anthony Hoskie was all in and Soukha Kachittauong made the call. Anthony held [Kh][Jc] and was drawing dead against Soukha's [Qc][6c]. The meaningless [8s] fell on the river to give Soukha the doubleup and the chip lead. Arthur Boulanger was all in preflop holding [Ah][Ks] and was in great shape to double up against Anthony Hoskie's [Ah][Jd]. When the flop fell [6d][3d][Jh], the roles were reversed and now Arthur was in great danger of being eliminated. The turn fell the [8c] and the river the [8h], and Arthur will exit the tournament in 3rd place, good for $5,500. Barry Rosenkranz was all in preflop and was called by Anthony Hoskie. Barry's [Kd][9d] was about 40% against Anthony's [Ah][8s] going to the flop, and the [2c][Ts][5s] flop wasn't much help. The turn fell the [2s] and the river the [Jh] to eliminate Barry in 4th place. He will collect $3,368 for his efforts. The bad beats just keep on coming! Eduart Bajrami moved all in from the button and was called by Soukha Kachittauong in the big blind. Eduart held [Qd][Qc] and just had to dodge Soukha's [Js][8c]. The [Jc][Ad][4d] gave Soukha five outs, but the [3d] turn reduced him to three. The [8s] hit the river and the entire tabled erupted. 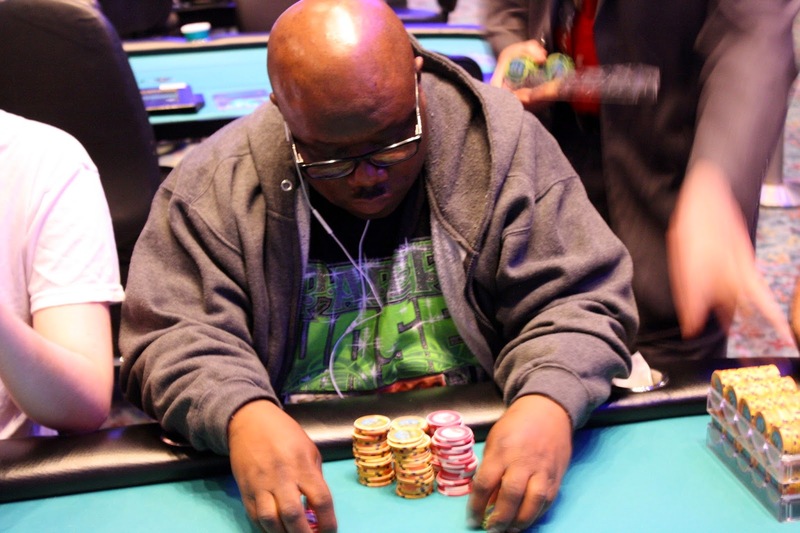 Eduart could only shake his head and collect his $2,566 for his 5th place finish. Ryan Sullivan was all in and in great shape to double up with his [Ac][Kc] against Anthony Hoskie's [Kh][Jd]. Before the flop, Anthony exclaimed, "I'm dominated! Give me a jack!" The dealer obliged as he spread the [3s][Jh][8h] flop. 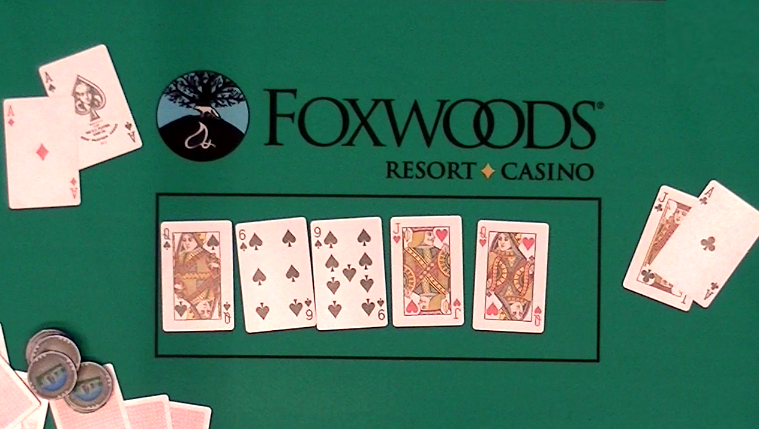 Ryan was now looking for an ace, but he didn't find it on the [9c] turn or [8s] river. That beat will knock out Ryan in 6th place, and he will collect $2,086 for his efforts. James Boynton moved all in and was called by Eduart Bajrami. James's [Ks][Jd] was dominated by Eduart's [Kh][Qc], but the [7h][7s][2c] flop gave James some hope for a chop. The [8s] turn gave him some more outs, but the [4c] river left king-queen high in front. 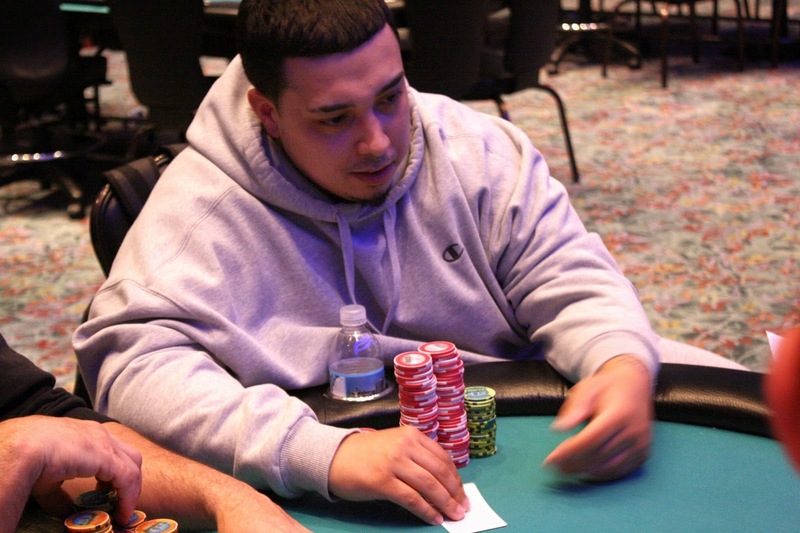 James will exit this tournament in 7th place, good for $1,684. Marty Gorenc was all in from under the gun and action folded to Soukha Kachittauong. Soukha made the call and exposed his [As][Ad] before action had finish. The remaining players folded and Marty showed his [Ac][Jc], which would need a lot of help. The [Qs][6s][9s] left Marty drawing almost dead, but the [Jh] on the turn gave him a glimmer of hope. He could not find the [Jd] on the river, however, as it fell [Qh] instead. Marty will earn $1,363 for his 8th place finish, and Soukha will be on a one round penalty for exposing his hand with action pending. Matt Senator pushed the last of his chips in from the small blind holding [Qh][2h] and was called by Ryan Sullivan in the big blind holding [Ac][3d]. Matt was live all the way to the river, but he failed to improve on a board reading [5c][9d][6d][7d][4h]. Ryan had rivered a straight to send Matt to the rail in 9th place, good for $1,089. 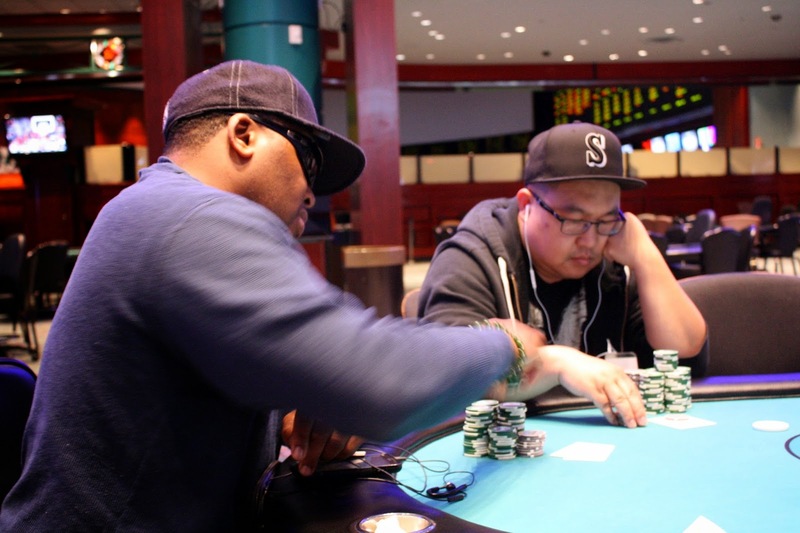 A player on the featured table 3-bet shoved the last of his stack in with ace seven and was unable to overcome his opponent's pocket queens. He will be the unfortunate bubble boy. Meanwhile the final 18 players are redrawing for their seats at the final 2 tables. There are now 19 players remaining in Event #9 $300 NLH, which means we are now on the bubble. The next player out will be the Bubble Boy, while the remaining will be guaranteed $641. Only 28 players remain from a starting field of 159 entrants, and those players are now on a 45 minute dinner break. When they return, blinds will be 5,000/10,000 with a 1,000 ante. The top 18 players will be in the money, so the bubble is looming as the players enjoy their dinner. Re-entries are available through the end of level 5. After getting heads up, Mik Santos had the chip lead and negotiated a chop that would award him $15,654, the title, and the trophy. Congratulations, Mik! Floyd Overton moved all in from the small blind and was called by Welther Marmol in the big blind. Floyd had the best hand with [As][3d] but would need to dodge Welther's [9h][6d]. The [8h][5h][Jd] flop gave Welther a gutshot straight to go with his live cards, and the [2h] gave him a flush draw as well. The river fell the [Th] to complete Welther's flush, sending Floyd to the rail in 3rd place. He will collect $10,000 for his efforts. 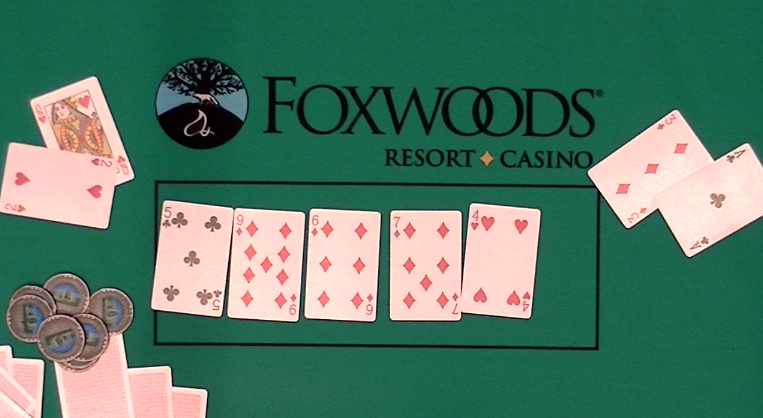 Elvis Reyes was all in preflop holding [Ad][Jc] and was up against Mik Santos's [Td][Tc]. It was another coin flip, and the board ran out [Ks][8h][5c][9c][2h] to keep the pocket tens in front. Elvis will exit the tournament in 4th place, good for $10,000.